Dr.Malpani's Blog: Angel investors - Knight, Knave , Pawn or King ? Entrepreneurs can be very helpful in stimulating the economy because they create new businesses which add value to society. They cannot do this without capital, which is why they need to raise money , and this is where angel investors in come in. However, the way angels view themselves is very different from the way entrepreneurs perceive them. Investors think of themselves as being knights - the good guys . They feel they have a lot of maturity and experience, and are willing to share their wisdom and invest their money in young entrepreneurs . They want to act as mentors , so they can help the company to grow and succeed, while earning a return on their investment at the same time. They think of themselves as being brave , because they are willing to put money on an unproven idea. However , a lot of entrepreneurs think of investors as being knaves. They are fearful that investors will purchase a huge chunk of their company for a pittance. They are scared that the investors will interfere with their dreams; and will stunt their plans through “back seat driving” through various control mechanisms and “affirmative rights” that investors insist on, . The ordinary man on the street often thinks of investors as being kings with deep pockets . 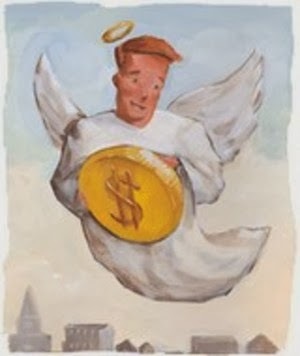 They feel these angels are savvy businessmen , who are happy to pump money into these startups, so that as they become billion-dollar companies, the angels become rich beyond the dreams of avarice ! The reality, however , is that a lot of angels find they are merely pawns. Once the entrepreneur has got their money, he conveniently forgets the verbal and written commitments made – he no longer bothers to keep them in the loop about what is happening in the business, many do not even have the courtesy to share ifinancials, and the angels remain helpless bystanders as the company goes down the tube , because the entrepreneur i is not willing to respect the agreement he has signed to and the court process to address grievance with takes forever. listen to reason. Even worse , when an occasional startup actually does start doing well, and seeks more funds from venture capitalists in order to fuel its growth, the VCs often insist that early stage angels exit the company at the stage they are entering, so they become the sole financial investors. . Angel investors in India have burnt their fingers so often, that they are very reluctant to participate in what seems to be an uneven playing field, where the odds are stacked against them !